We have some serious catching up to do! There have been first and twelfth birthdays celebrated, big stacks of share-worthy books read, and many interesting projects completed. If the baby-napping gods are kind to me, I’ll be visiting this space more often in the days to come. Fingers crossed! 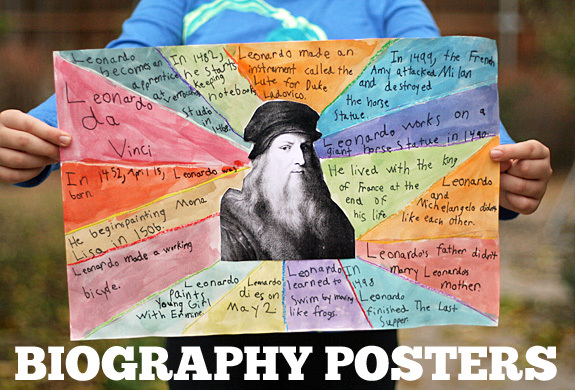 Let’s just jump right in with a book report project my girls had a blast working on – colorful and informational biography posters. This is actually a project we did at the end of last school year. You know, when summer-itis started to set in (yes, even us homeschoolers feel it!). 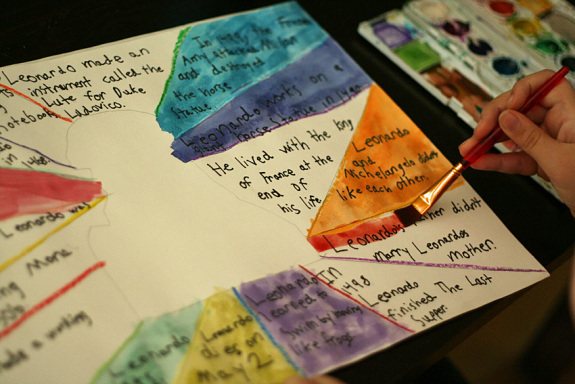 My girls usually enjoy reading biographies, and they love art projects, so this was a win-win in their minds. 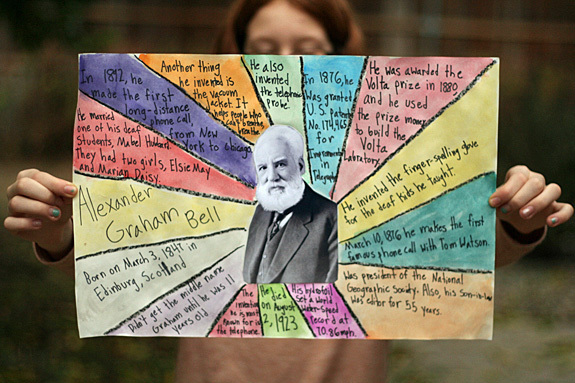 First, they each read a biography – Natalie read about Alexander Graham Bell and Delaney read about Leonardo da Vinci. 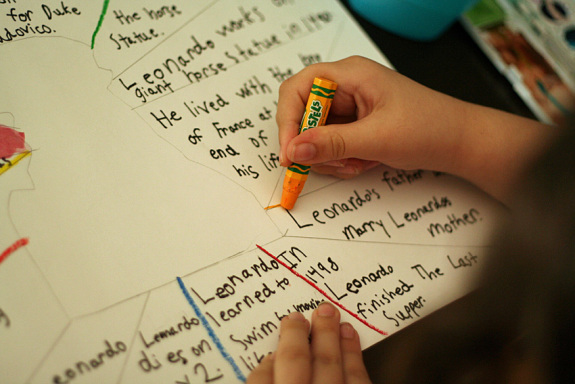 As they read, they used sticky notes to mark pages with interesting facts they might want to use on their posters. 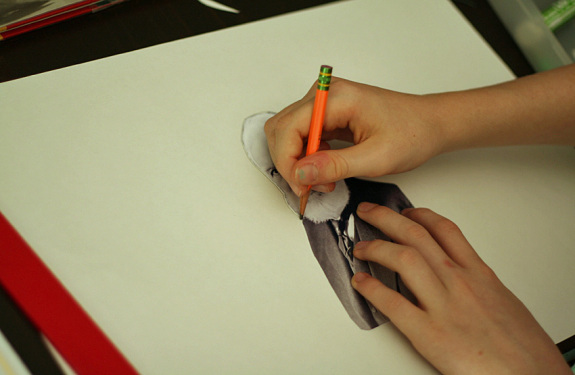 When it’s poster-making time, find and print a photograph (or painting/illustration) of your person. We found our photos on Wikipedia and printed on glossy photo paper. 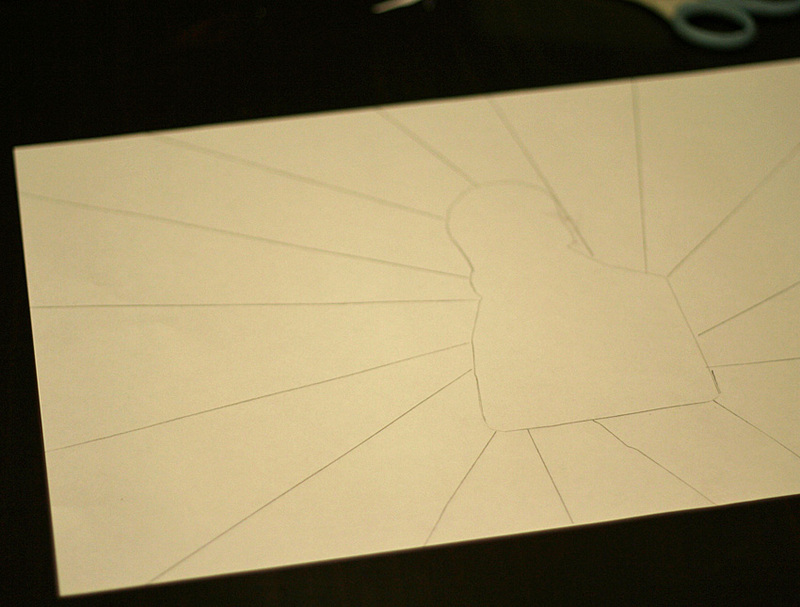 Cut out your photo, place it in the center of your paper, and lightly trace around it. Set the photo aside for now. 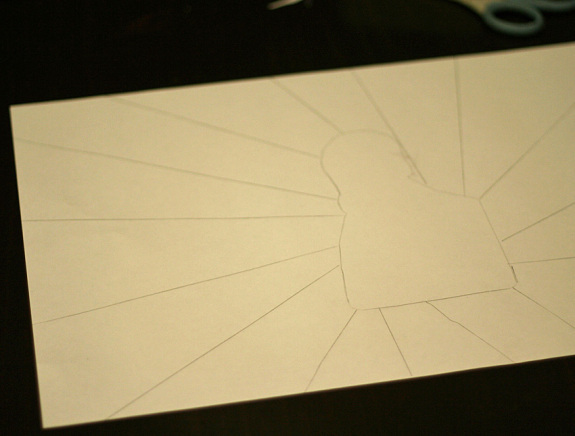 Using a ruler, draw lines from your traced outline to the edge of the paper, creating wedge-shapes around your paper. My girls said it was kind of like making the sun’s rays. Next, write a fact about your person in each section. I wanted the girls to include the person’s name and time period, but other than that I left it to their discretion. I actually love the mix of quirky facts and major accomplishments they came up with. Either write in pencil first and trace with a Sharpie, or just go for it with the Sharpie. My girls are not the “go-for-it” type, so they did the tracing method. Now, grab your watercolors and paint each section. Nice and colorful! When the paint is dry, glue your photo down. We definitely oohed and ahhed over these colorful posters. What a fun way to document and share our learning! Write your facts in chronological order around the photo. Include a famous quote or two. Make a grid instead of wedges for your facts. In case you are interested, here are the biographies that the girls read. They both really enjoyed their choices! 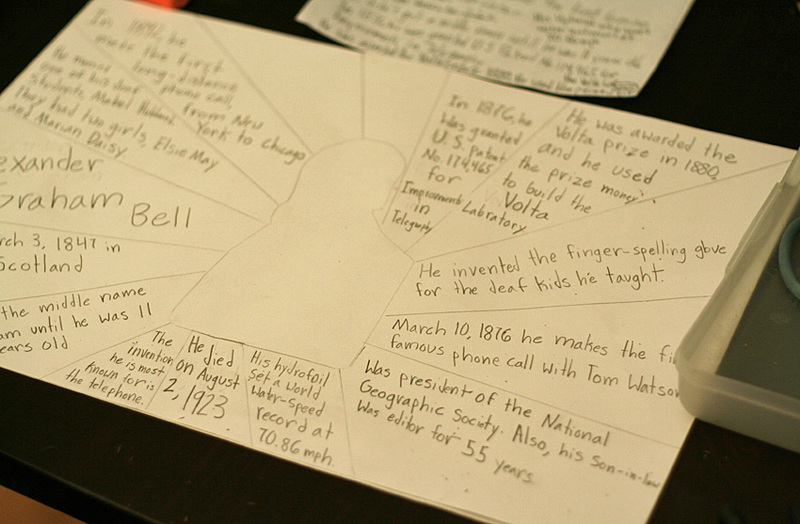 Always Inventing: A Photobiography of Alexander Graham Bell (National Geographic) – This book has amazing photographs, drawings, and quotes. Leonardo: Beautiful Dreamer by Robert Byrd – Beautiful, detailed illustrations with many interesting tidbits about Leonardo. I am not the kind of mom that plans a bunch of things to keep my girls busy and occupied. While I do set-up play and art invitations from time to time, for the most part my girls are masters of their own playtime. They have ample time for unstructured play, which they may spend playing with toys, drawing, reading, or running around outside. Of course, with all that free time, I do get my fair share of the “I’m bored….” complaints. I’m sure you are familiar with those words, too! But, I’m am not opposed to boredom. The beauty and importance of boredom is that with opportunity and practice, your child learns to engage with unstructured time. She learns to be with her thoughts, to ask questions, to wonder, to try something new. Sometimes, a dull moment of boredom is followed by a burst of creativity. 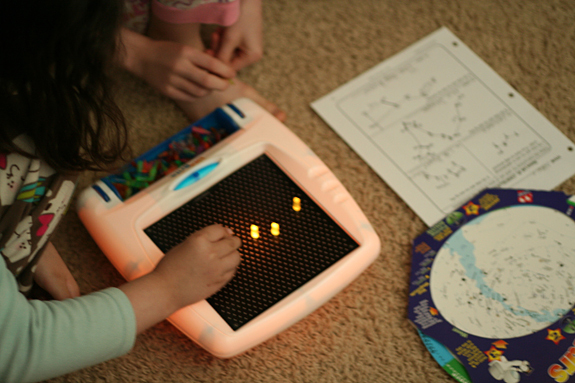 My girls have invented card games, built cardboard robot dogs, and tried making constellations on our Lite-Brite, all as a result of having nothing to do. I also think it’s important to remember that boredom is a real feeling.Even as an adult, I have times where I can’t seem to engage with any one activity. I flit from thing to thing, feeling restless and uninspired. So, boredom is real and boredom is good! 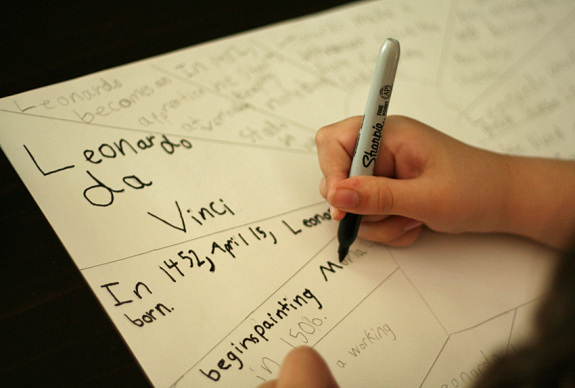 The goal is not to eliminate boredom from our kids’ lives. But, it is nice to have a few ideas for helping them deal with those feelings of boredom. First, check in – does your child need to connect? Try filling his tank with eye contact, snuggles, and a little conversation, then see if he is ready to go play. Prepare in advance for moments of boredom. 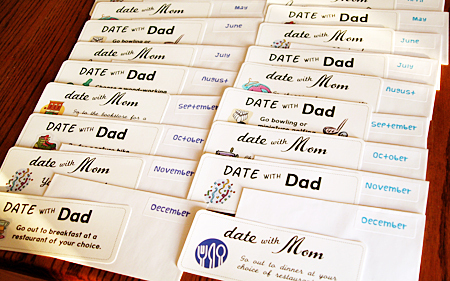 Brainstorm ideas of things to do and make a list. 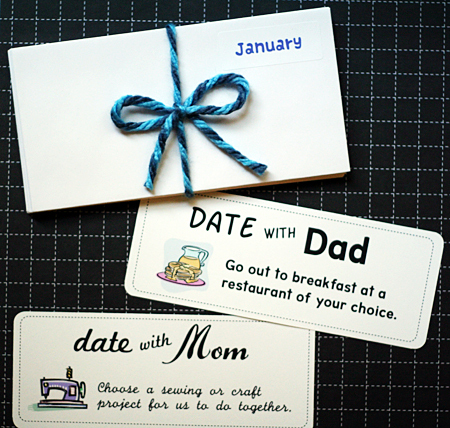 Or put all your ideas on cards in a bucket or jar. 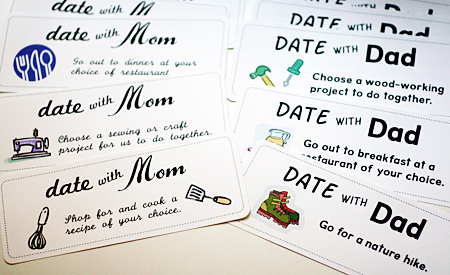 (You can check out our idea card bucket for inspiration.) When boredom strikes, remind your child about these resources. Go outside. Fresh air, rocks to collect, puddles to jump in, space for running – nature is a perfect boredom-buster. Join in. Again, maybe your child needs some connecting time. Sit down and play, read, or visit for a few minutes. Or, invite your child to join in with what you are doing. Helping with a chore might be just the purposeful activity she is looking for. Or, try to join in, get things rolling, then step away.I did this all the time when my girls were little. We would pull out a floor puzzle, I’d help them get going, then walk away saying something like, “I can’t wait to see how far you are next time I walk by!” This works with setting up a pretend play scenario, starting an art project, or pulling out a bin of forgotten toys. Bottom line for dealing with your child’s boredom: respond with kindness, offer a few gentle suggestions, and provide lots of opportunities for unstructured, child-led play. 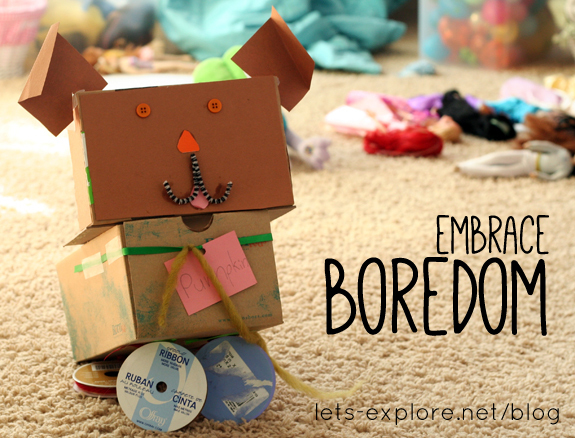 Do your kids get bored frequently or rarely? What’s your go-to boredom buster?